Anyone who has even the most rudimentary interest in the theatre will like this book. Note that this is a paperback re-issue of the book originally published in 1998. I’ve longed decided that theatre people, more than any other group of people or profession, live in the past. There are always stories to tell about things gone wrong or things gone extraordinarily right, and because we’re often not sure what (or when) the next job is going to be, the jobs we have had are most of what we have to talk about. In many ways, that’s precisely what we have here, except that those telling some of these theatre stories are people who have inside scoops on some of the most famous people and most famous shows in the history of Broadway. Every story in here was new to me and every moment was interesting. Editors Myrna Katz Frommer and Harvey Frommer have done an excellent job of gathering stories from some of the top names in the business and with only a few small exceptions, none of these stories had an air of superiority but were rather quite down-to-earth (this is not always the case when ‘stars’ tell stories from their early days). 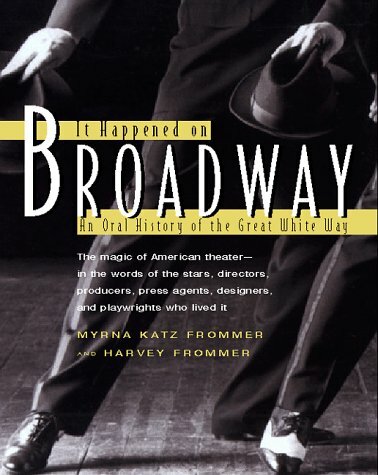 This is a book every theatre geek should have on his or her shelf. Looking for a good book? It Happened on Broadway is a delightful reflection on some of the early days of theatre’s mecca, often told by those who made it happen.